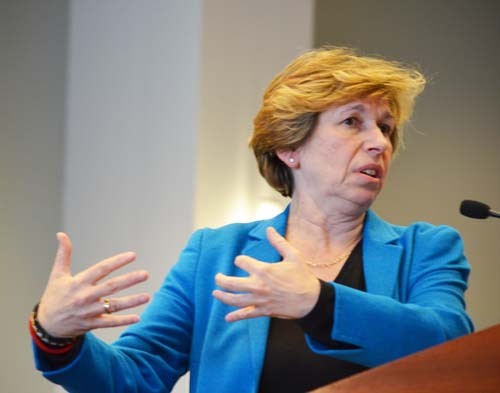 [Editor�s Note: This post focuses on the collaboration of Randi Weingarten with corporate education reform. One basis of this charge can be found from a conference of the American Enterprise Institute held on February 5, 2015. For suggested highlights of this more than four hour video of the conference see �Talking to the Choir: AEI panels discuss the attack on public education�. To access links from this post see �Turning �Collaboration� Into a Bad Word� at http://goo.gl/32SUwK. George N. Schmidt, Editor, Substance]. American Federation of Teachers (AFT) president Randi Weingarten came to Chicago on April 1, 2015, to speak to the City Club and answer questions. Later that day, she spoke to the Chicago Teachers Union House of Delegates (above) but didn't have time to honor or answer questions. Substance photo by Sharon Schmidt.The disastrous budget that Governor Cuomo has achieved in New York deepens the attack on teachers and public education. Among its many regressive measures, the budget includes evaluating teachers based on standardized test scores. This is despite the American Statistical Association estimating that teachers affect test scores by a factor of 1% to 14% , and that evaluating teachers by scores may actually reduce quality. This hostile takeover of public education by corporate education reform is unfolding year-by-year, month-by-month. It is based on the economic theories of rightwing economist Milton Friedman. His vision for privatizing education can be seen in this 1995 paper written by him. For understanding of the consequences of Friedman�s economic agenda see Shock Doctrine: The Rise of Disaster Capitalism by Naomi Klein. The growing Opt Out movement, mainly lead by parents, is the first sign of the growing opposition to the corporate agenda. After a year of being ignored by the corporate media, the Opt Out movement is gaining national attention, much to the dismay of education officials who have signed on to the corporate agenda. The national leadership of the teachers unions, the National Education Association and the American Federation of Teachers, have mouthed verbal support for Opting Out, but they have not put financial or organizational effort into the cause. A clue to why this is so can be found in a video of a conference of the right-wing American Enterprise Institute held on February 5, 2015. The conference was a series of panels from researchers supporting corporate education reform. A centerpiece of the discussions was the document �Singing from the Same Hymnbook�: Education Policy Advocacy at Gates and Broad. This paper is by Sarah Reckhow of Michigan State University and Megan Tompkins-Stange of the University of Michigan. The �Singing from the Same Hymnbook� paper explains why the leadership of the AFT has been missing in action in the Opt Out movement. On page 12 they detail how the corporate education reformers are deeply embedded in the U. S. Department of Education under Arne Duncan. This is followed by a description of AFT President Randi Weingarten�s collaboration with them to create a teacher evaluation system based on standardized testing. What follows is an extended excerpt (pages 17 - 19) from �Singing from the Handbook� about this collaboration with the Gates and Broad Foundations to create a teacher evaluation system based on standardized tests. Overall, a pattern emerged wherein Gates and Broad increased advocacy grant funding to groups that gave frequent testimony�defined as three or more appearances before Congress from 2000 to 2012. Advocacy grant dollars to these groups grew by more than $12 million from 2005 to 2010�well above the overall growth in funding for national advocacy groups. The overall increase in national advocacy funding from Gates and Broad was 140 percent from 2005 to 2010, while the funding to those who gave frequent testimony (included in Table 1, page 16) increased by tenfold. This funding growth supports new actors, like The New Teacher Project, as well as the establishment groups, like the NEA and AFT. This suggests that Gates and Broad were pursuing a two-pronged funding strategy: diversifying the voices in the debate and extending ties to the education establishment. Yet support for an organization that delivers testimony is not direct evidence of alignment with the foundation� s agenda priorities. In some cases, increased grant support was channeled to organizations that had already shown support for reforms such as using standardized tests to evaluate teachers or implementing performance pay systems. For example, The New Teacher Project (Editor�s Note: which was at one time headed by Michelle Rhee) released � The Widget Effect� report in 2009, supporting a major overhaul of teacher evaluation; since 2009, the Gates Foundation has committed $13.5 million in grants to The New Teacher Project. Representatives from The New Teacher Project testified before Congress in 2009, 2010, and 2012. Meanwhile, the president of the Center for American Progress, John Podesta, testified twice in 2007 in support of linking teacher compensation to evaluation systems. The Broad Foundation began funding the Center for American Progress in 2007 and has since continuously supported the Center for American Progress with almost $1 million in grants, including three grants focused on teacher incentives or pay for performance. Shortly after Daly� s testimony, Professor Thomas Kane of Harvard University (and lead researcher on the Gates-funded Measures of Effective Teaching project), commented on Weingarten� s cooperation with Measures of Effective Teaching: �Randi Weingarten deserves a lot of credit for supporting that effort, even when it was not easy.� Thus, the content of the Congressional testimony suggests that organizations appearing frequently before Congress and receiving foundation funds often provided aligned recommendations and perspectives on the issue of teacher quality�views that also aligned with Gates� and Broad�s priorities. Month by month, year by year the conditions in the public schools are being eroded - and it is not only in New York under Cuomo. This is the result of the deliberate policy of starve the public schools, feed the charters in order to advance the privatization agenda while using standardized test scores to close or turnaround schools to charters in low income areas. The hubris and aggressiveness of the corporate education reformers is because they know there will not be an organized and determined fight against their privatization agenda. This collaboration has been going on for a long time. They know that (unknown to their members), not only is the leadership of the American Federation of Teachers standing down from what a union is supposed to be, they are collaborating with the corporate education reformers.